We expect cryptocurrency fireworks this weekend as EOS and Tron launch their mainnet. While the general aura is positive, the discovery of a smart contract flaw in EOS by a Chinese security company 360 raises more questions than answers at this critical time. Regardless, if the launch goes on well on June 2, price action could override all the negativity and quash all rumors and speculations. In the meantime, IOTA is a straight buy where stops at May 29 low would do the work. So, besides the Chinese Government’s (China Electronic Information Industry Development) CCID department, Weiss Rating is doing a pretty good job in reviewing and rating different cryptocurrencies and tokens. In their recent release, which is available for free, up to 93 different coins were thoroughly vetted. Weiss Ratings review coins and assign them grades depending on their technology and user adoption-for developers- and risk-reward ratio investors follow. According to Weiss, Bitcoin scores a general B originating from their D+ risk-reward ration which investors are bound to have and an encouraging B from Technology and user adoption. Well, this is odd considering Bitcoin dominance and the steps the core team has taken to ensure all technical developments are beneficial for everyday users. Then again, volatility cuts through the industry so why Bitcoin got a D+ for risk-reward mainly from price swings is not clear. Week over week, Bitcoin prices are down five percent but in the last 24 hours, they are up four percent. Well, it isn’t impressive considering the general expectancy in the market following May 29 bullish engulfing pattern. In my view, what we need is a confirmation of that double bar bullish reversal pattern and the best demonstration is a breach and closes above $8,000. However, this doesn’t bar any trader from going long at current prices aside from the tight trading range. If they do then stop at $7,000 would mean opportunities for low risk and potentially high rewards if our bullish projection pans out alright. In a new twist of events, another cryptocurrency trading app, The Taylor was hacked. Confirming the heist, Fabio Seixas, the CEO and Founder of The Taylor, said close to $1.35 million worth of ETH is missing. That’s about seven percent of The Taylor’s total coin supply meaning by the time the siphoning was over, the company had $25,000 left. Even though the founder and advisor tokens were not affected, it’s clear that the remaining funds cannot sustain the full operation of the trading app. The Taylor is most likely to cease operation if there is no outside intervention. Syncing with our previous analysis, Ethereum is finding support for our main support. Note that there is a double bar bullish reversal pattern with May 29 candlestick hinting of possible higher highs. As always, picking bottoms is but a risky business and so any follow through of yesterday’s bullish candlestick means we go long today with targets at May highs at around $830. You can as well fine-tune long entries in lower time frames as the 1HR chart should you want a tight stop loss. As Bitcoin Gold (BTG) and Verge were battling with possible 51 percent attacks, Litecoin creator Charlie Lee is assuring the Litecoin community on the robustness of the network. This comes at the back of interesting findings from Crypto.51 App who studies the cost it would take to take control of various networks for one hour. In his response, Charlie Lee said his network has well-distributed mining pools with high hash rates. Besides that, the cost implications-upwards of $700 million would actively bar attacks. On the daily chart, there is a revival of Litecoin prices at the key support level of $110. 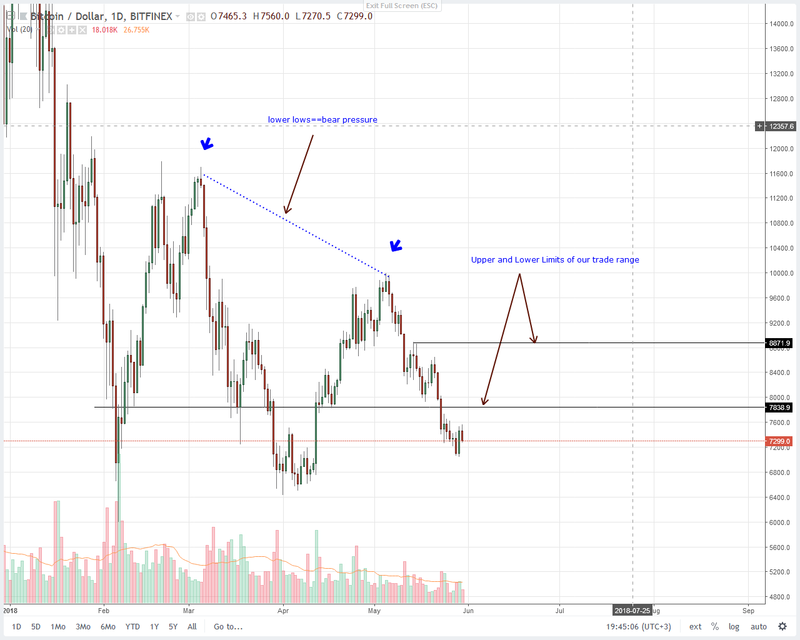 Ideally, $100 would have been better as it is a round number but still, the fact that we have that nice bounce off $110 complete with above average trade volumes as May 29 candlestick shows hints of potential higher highs in the coming days. Because of our previous trade plan, it’s better if buyers step on gas and push prices above $130. From there Litecoin buyers can load up their position and aim first at $180 with stops at $120. According to Weiss Ratings, EOS has better technology than Bitcoin and Ethereum. Remember, Weiss Rating is assigning this to a platform without a working product. All we have is nothing but promises if not expectations. Then again, we remain critical after yesterday’s exposure of network vulnerability by a Chinese internet security firm 360. Even though they claim to have patched it as soon as the flaw was found, the speed in which they did it in light of the magnitude of the project raises eyebrows. It is the same smart contract problem that continues to be a thorny issue in Ethereum. For now, let’s see if the project will pan out alright. If there is a postponement of EOS mainnet launch, then it would be disastrous for the price. What we are seeing in the daily chart is a consolidation where price action is moving tightly within a $4 range with support at $10 and strong resistance at $14. That’s May 20 highs and should be our buy trigger assuming we see buyers jumping in and confirming that spark of buy activities on May 29. Notice that on this day market participation was above normal. That’s not all. EOS close is higher in line with May 24 bullish engulfing candlestick. The IOTA development team has been talking about the Trinity wallet for a while and what a nice jolt it was after the audit announcement was made yesterday. Of course, it might be a nice coincidence but that news alone saw prices jumping more than 20 percent by end of May 29. The Trinity wallet and page are really nice! Great job to everyone involved! For a few months now the #IOTA Foundation produces the best results for everything. Staff, advisors, software, industry adoption, solutions, vision. Trinity is a nice wallet with simple to use interface that will make it easy for investors or traders to buy, hold or sell IOTA. At the moment, it’s only available in mobile version. The desktop version is still under development. Price wise, we have a nice double bar bullish reversal pattern. The surge in market participation alone and the resulting bullish engulfing candlestick alone is the green lights for buyers to buy at current prices and aim for May highs at $2.60. Stops should be at $1.3 or May 29 lows.